Please go on another hunt for me and look for the November issue of Gourmet Magazine to check out the cover and the "Over the Top" spread on pg. 120. There you will find these gorgeous pages filled with Thanksgiving food that my partner, Lish assisted on styling and making the food for the photo shoot (she is a freelance food stylist for various magazines and food tv shows). The colors in this story were so rich as you can see from the cover image above. The turkey is perfectly golden and the rosy apples with all the mysterious and murky blues as a back drop - it's really decadent. 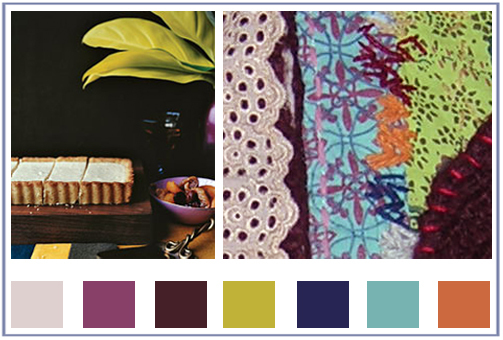 If you can't tell yet I am in love with Gourmet's food spreads and think they do an amazing job with color as you can also see in these previous two posts here. So as mentioned in an earlier post I'm really into mysterious and dark photographs with pops of color and loved this story from Gourmet Magazine At first glance it captured me immediately because I was on the fence of whether or not I liked it. I wasn't sure if the food was getting overpowered from the drama surrounding it, but then I concluded that the food was actually more seductive and complex because of the lighting and bold colors from the props. And suddenly, this beautiful color palette emerged before my eyes and now is stopping me in my tracks. I'm loving it right now. 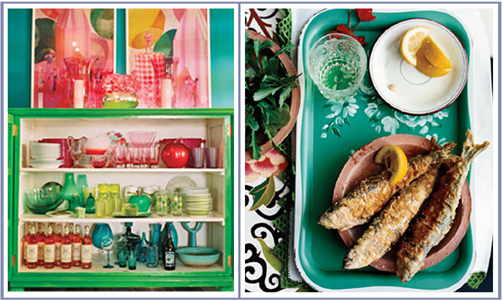 Oooooh, what a dream to have a cupboard filled with a rainbow of glasses, plates and dish-type things! I've been wanting to involve food related subjects into this blog because there are so many appetizing shades from the food world that don't get enough color recognition. And presentation is also intriguing to me, which is why I love the picture on the right. The turquoise tray makes the fish on show so much more fun and quirky, while adding the lemon and soft hints of red keep the picture appetizing. There's a rule out there that says never to use blue hues in a restaurant or on a table because it creates for an unappetizing experience. But, I say don't follow rules when it comes to color if it feels right to you, especially if the accent colors used around a blue are sumptuous. 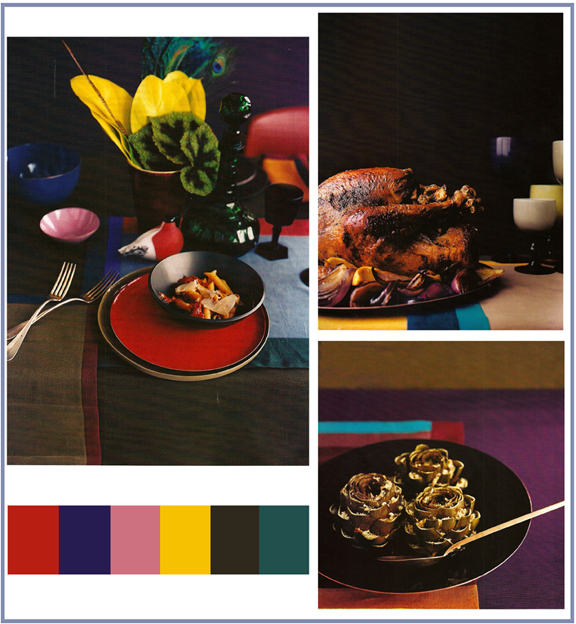 So, what color will you be plating your food on tonight?